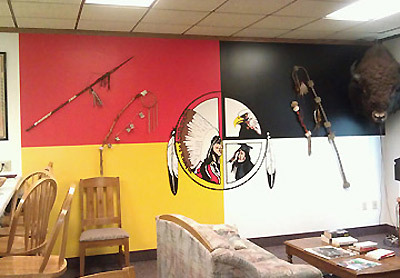 The Native American Cultural Center provides counseling, advising, and academic student transitional assistance to Native American/American Indian students at Minot State University. Student personal, social, financial, and career concerns are also addressed at this "home away from home" rest and relaxation student center. The center hosts the Native American Cultural Club. Coordination and correspondence with area tribal councils, offices and colleges is also maintained to benefit and support our students. Campus and community events are developed and presented to promote public awareness, understanding and appreciation of Native American people and their culture. A portion of the MSU Native American Collection of cultural artifacts is also on display for public viewing. The Native American Cultural Center is open Mon. - Fri., 8:00 a.m. to 4:30 p.m.